Overwatch characters are like pieces on a chess board. Whether we’re talking about David Bowie reincarnated as a mad scientist or a hulking hook boy who’s probably never heard of David Bowie, everybody’s unique abilities are kept in check by the structure of the game. Now imagine if that structure—the lines on the board—didn’t exist. 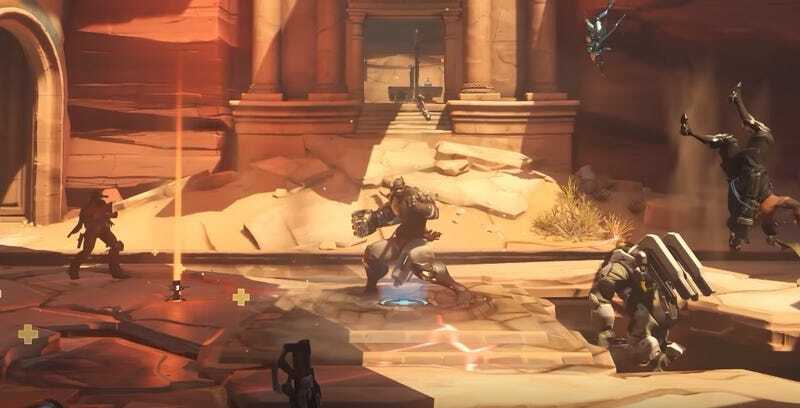 Yesterday, Overwatch got a new free-for-all deathmatch map, Petra, and a ranked competitive deathmatch mode to go along with it. Cue complaints about how the map is unbalanced in favor of certain heroes, too spacious and too cramped, and overly encouraging of cheesy strategies that maximize kill stealing. Competitive mode, which by its very nature encourages people to win at all costs, only exacerbates these issues. But they’re also products of deathmatch being grafted onto a game about two teams competing to see who can verbally berate their healers loudest (while also pushing a payload). Overwatch is a team-based game and—removed from that structure—has some glaring issues that Petra inadvertently does a great job of illustrating. When players complain about the map being too spacious, for instance, what they’re actually noticing is that Blizzard packed it with variety so that characters of all types could, in theory, hold their own depending on where the battle ends up taking place. The multi-tiered arena in the center favors rangy, high-mobility heroes like Pharah, McCree, and Widowmaker. The cramped corridors nearby favor closer-range heroes who excel at taking advantage of chaos like Mei and Moira. The adjacent wide-open outdoor space is good for tankier heroes like Roadhog and Reinhardt and snipers like Widowmaker and Hanzo, thanks to all the sightlines. On paper, this map design is a good idea. Overwatch is defined by its rainbow roster of space apes and earth grandmothers, so it makes sense to give everybody room to breathe. If pockets of the map didn’t favor certain heroes over others, an even smaller handful would reign supreme while everybody else spammed “I need healing,” but their cries fell on deaf ears. The problem, though, is that battles tend to concentrate in select portions of the map before dispersing and then concentrating again elsewhere. As a result, you end up spending a lot of time walking to wherever a fight is taking place and then either picking off whoever’s on the verge of death—thereby getting full credit for somebody else’s hard work because of how the scoring system works—or quickly dying because the hero you’re running just isn’t suited to that part of the map. You can just chill on one part of the map and wait for people to come to you, but that’s a snooze-and-a-half and—thanks to Overwatch’s inactivity timer—can legitimately get you in trouble. Then you have the mode’s win/loss system. Free-for-all deathmatch is an eight player mode where only one player can win first place, but a total of four players can “win”—or get additional XP and credit toward one of their weekly loot boxes. As a result, matches are about staying consistent and making sure you don’t fall out of the top four. But it’s hard to stay consistent when you’re having trouble finding players to kill. Here’s an insanely frustrating scenario: you’re about to fall out of the top four and you’re looking for somebody to fight. You see a McCree twiddling his thumbs in the distance, bear down on him, and nearly finish him off. Then some Moira comes out of nowhere, gently tickles his pinky toe, and scores the kill. The game, which is still wired to function like regular Overwatch, tells you that you got credit for that elimination, because that’s how eliminations work in regular Overwatch matches. In FFA deathmatch, however, your points do not go up unless you deal the finishing blow—even though the game still says that you got the elimination. So you fall out of the top four even though you, by all accounts, did everything right. It’s only natural that corralling all this chaos into a competitive mode would result in some painful rope burn. Initially, the ranking system was sorting professional players into Diamond—three ranks below the top—and kill-stealing continues to be a big issue. It’s frustrating to lose rank in this mode because, even more so than in regular Overwatch, it often feels like it’s out of your hands. Don’t get me wrong: I think Overwatch’s FFA deathmatch mode can be fun under the right conditions. And I actually think Petra does a great job of trying to address the mode’s issues. All the space means that 1v1s occur more frequently than on Overwatch’s only other deathmatch-specific map, the confined Junkrat basement hell that is Chateau Guillard. This allows individual heroes to shine, and it’s harder for others to swipe your kills at the last second. There’s also a thrilling tension to skulking around Petra, listening to audio cues and trying to get the jump on opponents before they get the jump on you. It’s a game of cat-and-mouse punctuated by explosions and laser beams. You have to think on your toes. Petra brings a lot of variety to the proceedings, which is a blast when you’re not seething through gritted teeth. You just can’t take FFA deathmatch seriously, though. It’s a wacky mess. You can’t act like its competitive variant says anything about your actual skill level, because the game wasn’t designed to be played this way. Overwatch is not a free-for-all or deathmatch game, and it never will be no matter how much work Blizzard puts into maps or modes. You either embrace the chaos, or you let the frustration drive you batty.